The first three Catholic parishes founded in Toronto were St. Paul in 1822, St. Michael in 1845, and St Mary, seven years later in 1852. The Church of Jesus Christ of Latter-day Saints was granted access to the Archdiocese of Toronto archives some years ago and microfilmed the registers of various parishes, including the first three, up to 1910. This microfilming program has been converted into the browse only database Ontario, Roman Catholic Church Records, 1760-1923 on Familysearch. After selecting the database, navigate to → York→ Toronto. This will bring you a list of digitized parish registers. It is worth the effort to consult these registers as Irish parish and county of origin information it often provided for marriages beginning about 1850. Failing that, many marriage register entries provide the parents' names for marrying parties. In 1850, Neil Mallen from Dickmancreven [sic - probably Tickmacrevan] Parish, County Antrim married Margaret Brian from the parish of Hackettstown [sic], County Wicklow in St. Paul's parish. Both of their parents are named in the register entry. An example from St Mary's parish shows John Cleary from County Clare married Catherine Cawley from County Tipperary in 1862. Again, both sets of parents are named. Similar information is found in the entry directly after John and Catherine's. Toronto is a central location for those who may have intended to travel into the rural areas of Ontario, New York State, or the American mid-west. 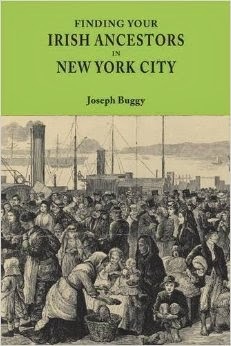 Equally, those Irish immigrants may have stated in the city. If you have been unable to find marriage or baptismal records for your ancestors who ended up in those regions then don't discount the Toronto Roman Catholic registers. Access these three parish registers and those from many other parishes in Ontario here. https://www.archtoronto.org/archives/Resource%20Library/archivaria_ARCAT1990.pdf: accessed 28 May 2016. St. Paul's Roman Catholic Parish, (Toronto, Canada); Baptisms, marriages, burials 1834-1850; p. 459, no. 42; Neil Mallen married Margaret Brian 29 June 1850; digital image, "Ontario, Roman Catholic Church Records, 1760-1923," Familysearch (http://www.familysearch.org): accessed 20 August 2016. St. Mary's Roman Catholic Parish, (Toronto, Canada); Marriage Register 1858 to 1896; John Cleary married Catherine Cawley 7 January 1862; digital image, "Ontario, Roman Catholic Church Records, 1760-1923," Familysearch (http://www.familysearch.org): accessed 20 August 2016.